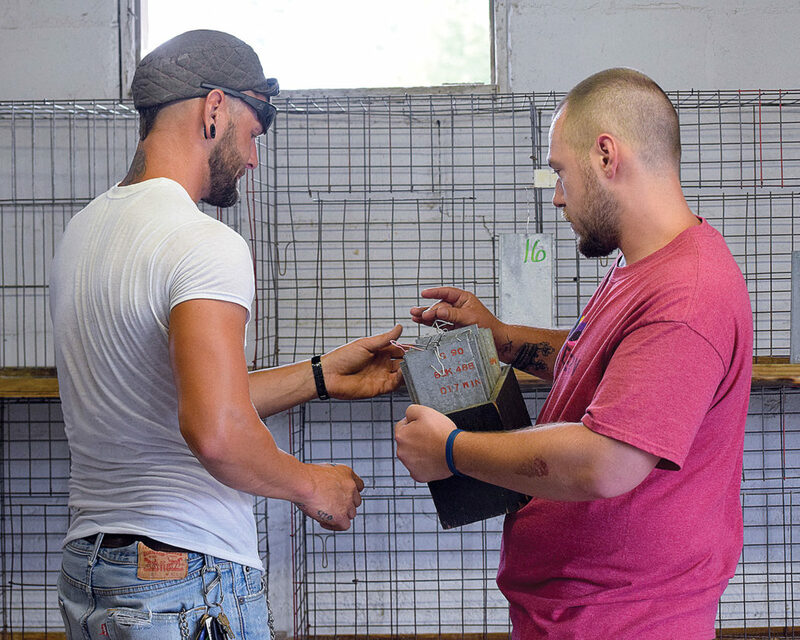 PHOTO BY JILL GOSCHE Lance Weiland (left) and Gavin Shaw place identification cards on rabbit cages at Seneca County Fair Monday evening. To view more photos from this event, visit cu.advertiser-tribune.com. Volunteers helping to prepare Seneca County Fairgrounds for next week’s fair were described as a “godsend” Monday. Five men from The Cottage — Cory Cook, Dillion Fowler, Gavin Shaw, Brandon Taylor and Lance Weiland — volunteered their time to help set up the rabbit barn at Seneca County Fair Monday evening. The Cottage is a second chance for men recovering from addiction who are looking to get their lives back in order. The volunteers worked with Carolyn Gittinger, an adviser for Seneca County Junior Fair’s rabbit department, and her husband, Randy, Senior Fair Board’s representative for the rabbit department. “I’m already hours ahead. … They work hard when they come out here,” she said. Gittinger said she never had had that much help. “Whatever you need done, we’re here to do it,” Weiland told her. Cook also had helped clear wood from around the grounds. He said blessings come and go, and it’s on an individual to pay it forward or not. It feels good to watch selfless people work, he said. “People should give back more. … I spent so much time taking away, so I enjoy this,” he said. Fowler said he visits the fair every year. He said he usually attends the derby and to get fair food. It’s nice to give back and help people without expecting anything in return, he said. Weiland is a roofer and landscaper, works three jobs and works seven days a week. He said work at the fairgrounds was relaxing and he loves helping. “Anything I can do to give back,” he said. Weiland said everybody at The Cottage is working. He said he has been there for four months and does better in an environment when he has to answer to somebody. “I need to be held accountable,” he said. Tevin Drosky, program coordinator for New Housing Ohio who oversees The Cottage, said she believed it was the first year men living there volunteered for the fair. She said residents need to do volunteer hours, and it’s difficult for the staff to find places. The men want to give back, she said. “They like working out there (at the fair),” she said. Drosky said The Cottage is at full capacity of 11 with 10 on the waiting list. The men, she said, will do anything for anybody. “They’re pretty close to one another. … They’re good guys,” she said.